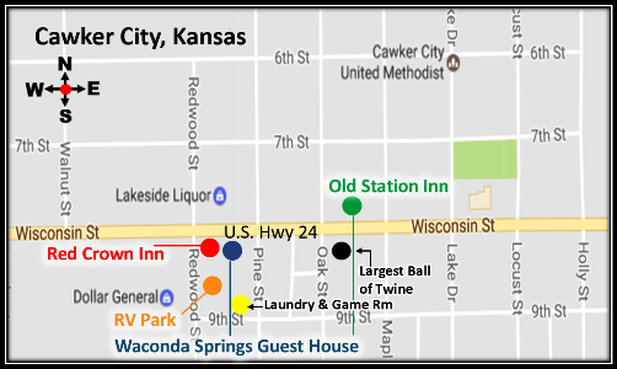 We offer 3 GREAT lodging opportunities in Cawker City, Kansas, home of the World's Largest Ball of Twine and minutes from Waconda Lake! If you are needing a place to stay, give us a call. We're located directly along U.S. Highway 24, in Mitchell County Kansas. Our newly remolded overnight accommodations will quickly meet your expectations! Perfect for families and larger groups, whether you are hunting, fishing, visiting friends or family or just enjoying a few days at the lake …when you stay at our newly remodeled guest house you'll be comfortable! You'll find Waconda Springs Guest House at the west end of town, on the south side ​of ​US Highway 24; just look for our BIG CATFISH SCULPTURE sign! Children under 18 stay for FREE! Perfect for singles, couples or small families, whether you're passing through, visiting friends, hunting, fishing or enjoying a few days at the lake you'll get a kick out of staying in newly remolded retro gas station Inn - it's a blast from the past! ​US Highway 24, next immediately next to Waconda Springs Guest House. Perfect for singles, couples or small families, whether your're passing through, visiting friends, hunting, fishing or enjoying a few days at the lake you'll get a kick out of staying in newly remolded retro gas station Inn - it's a blast from the past! just ​across the street from the World's Largest Ball of Twin!